For reservations received after June 1st, please remit full fee of $525. Why go to French Camp? French Camp is an opportunity for youth to enjoy a week surrounded by French and francophone culture, cuisine and a chance to enjoy outdoor activities and just have fun. French Camp is run by a group of educators and volunteers from the Missoula community, including French and francophone natives. French camp is held at beautiful Georgetown Lake, at Camp Watanopa. Camp Watanopa, owned by Camp Fire, Inc., Ponderosa Council of Missoula, is located on Georgetown Lake near historic Philipsburg, Montana in the beautiful Pintlar Mountain area. It has six sleeping cabins with 10-14 beds (5-7 bunks) in each, two small buildings, and a dining hall. Campers must supply their own warm sleeping bags or blankets and pillows. Quiche, Tarte Flambée, Soupe à l’Oignon, Salade Niçoise, Croque Monsieur, Fondue…. 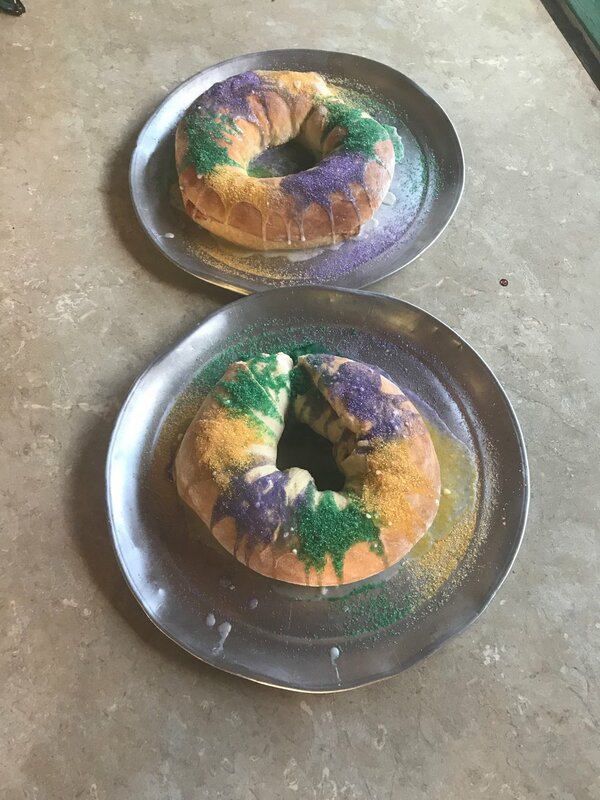 And for Mardi Gras, we celebrate with Gombo and King Cake! Let’s just say you won’t get bored. Each day begins with the raising of the French flag and singing of La Marseillaise, and some French-themed yoga. We have an hour of class in the morning and afternoon- all skill levels welcome. We practice vocabulary and basic conversation with our workbook, games, art and activities. We don’t guarantee your student will come home speaking fluent French- but if speaking French is their passion, we promise to fill their week with it! We also have chorale each day, where we learn and sing French songs, and activities such as crepe-making and art projects. Every day, weather-permitting, we spend time at the lake with our lifeguard swimming, paddle-boarding, and canoeing. In the evening we have a race or competition to practice the day’s vocabulary and sing songs around our campfire. (We may even start a fire if there are no bans in the area!) On Tuesday during camp, we have a Mardi Gras carnival, and on Thursday night, we turn the main hall into a disco and have LA BOUM- our dance party! French Camp volunteers work hard to create a fun and interactive week full of wonderful food and unique cultural experiences while promoting french language. Our dedicated volunteer staff includes current and retired French teachers, native French speakers, and university students. We employ two professional cooks and a certified lifeguard. Our core group includes: Director Katie Wyskiver, French teacher at Hellgate High School; Frederique Leiritz, a native French speaker and business owner in Missoula; Bryan Whitney, French teacher at Sentinel High School; Peggy Patrick, retired French teacher; Brady Baughman, French and ESL teacher with MCPS; Kari Shelkey, English and French teacher with MCPS; and Morgan Landais, native French speaker and former MCPS French student. We also have a certified lifeguard, EMT-certified medic, and two chefs with many years of experience preparing French food each night. Each member of this core group has spent many fun summers inspiring campers to learn french in a fun and vibrant atmosphere. Please write checks to “AF Missoula French Camp” and add your camper’s name in the memo.